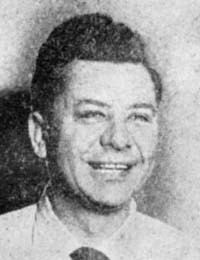 We find in a feature article from 1956 that Charles Edward Mims was his real name, born in Columbia, South Carolina. But country music fans came to know him as Slim Mims. When he was just a small youngster, the family moved to Hamer, where his father opened a general store. While growing up, Slim was involved with the typical activities of a youngster, playing baseball and hunting, but also found time to work at the local mills as well as help out his dad at the family store. It was no accident it seems that Slim got himself into a musical career. That 1956 article mentions he would entertain the folks on Saturday night, "...dressed up in his Sunday best", take his guitar and spend the night playing at the weekly square dance in the county. We don't know if he got his comedic start before his radio stints, but Slim showed he had the entertainer's eye for pleasing an audience one night. It seems during an appearance with a group called the Hawaiian Harmonizers, the comedian for that band was unexpectedly ill. The show was already started, so Slim took it upon himself to dress in an enormous pair of ragged pants, a "..violently colored shirt" and just strolled on stage in the most casual mannera and proceeded to win over the audiences with a non-stop patter of jokes. After that show, he found a nickname that would stay with him through the years. A fan in that audience came up to him and told him, "You're the ugliest, funniest person I have ever seen." And so "Uncle Ugly" was born. Slim first started entertaining radio audiences back in 1935 in the town of Florence, South Carolina, but no mention was made of that first station. It was said he played at about ten other radio stations before finding himself returning to one of them, WJMX in July of 1947. At that time, they had a noon time radio show, or rather more precisely, a 12:15pm show and again at 3:30pm. WJMX was at 970 on the AM radio dial. Slim and the Dream Ranch Gang were also on television back then. They had a show on WBTW and also on Channel 7, WNCT-TV in Greenville, North Carolina. That show was called the "Silent Flame Jamboree". No mention was made of how or why the show got its rather unusual name. 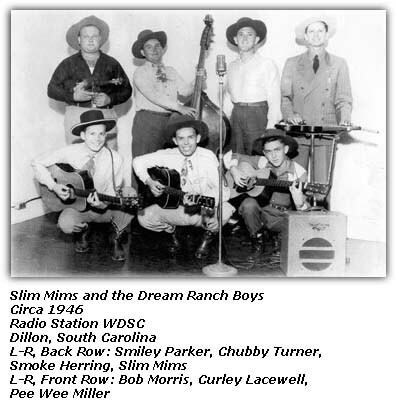 Slim was said to have formed the Dream Ranch Boys back in 1940. The boys won a following in the area and found work at many events in schools, churches and venues with not only their music, but their humor. In a bit of trivia notes, We learn that Slim's only sister, Margie was running the family's general store in Hamer at this time (circa mid-1950s). The store opened in 1920. Slim had a brother, Major Brown L. Mims, who was serving in the U.S. Marines Corps. 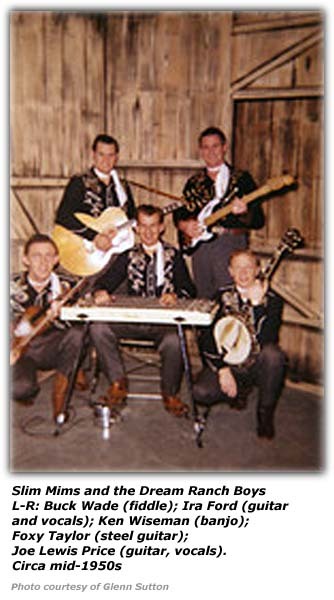 In 1953, an eighteen your old by the name of Lewis Price joined Slim's Dream Ranch Boys as a lead singer and playing guitar. He was one of the longest tenured members of the band. Some of the other band members that Lewis played with during that time were Jimmy Capps, Clyde Mattochs, Russ Hicks, Jerry Black, Buck Wade, Hubert Davis, Luke Spivey and Glenn Sutton. Military service interrupted Lewis' career and after his discharge, did not play publicly again until around 1992, when he took up learning to play the fiddle. He went on to play with such groups as Southern Style Bluegrass Band, GIll Creek and Bill Wells and the Blue Ridge Mountain Grass. That 1956 article gives up some details about the members of the band. Patti Faye was Slim's wife and they had a son. Roger Lee "Buck" Wade, was from Maryland. He was on television with Slim when they were at WNOK in Columbia, South Carolina. In addition to the various instruments he played, he was said to also be a first-rate mechanic. Another member was Joe Black, who was said not to be 'Little' as his nickname implied. He was also a bit of a songwriter, writing such tunes as "Gates of Heaven", "The Grass is Greener On the Other Side", "Race for Love", and "Danger Lies Beneath Those Eyes". No other details were provided about "Carolina-born" Joe Price other than the instruments he played. We had the pleasure of hearing from one of Slim's former band members, Glenn Sutton. He told us he worked with Slim while he was stationed at Shaw Air Force Base (AFB) in Sumpter, South Carolina in 1957-1958. He tells us the band played each Saturday night at the Dream Ranch Barn in Florence. Glenn sent along a picture of the band back then. He also told us of another member of the band at one time was Jimmy Capps, who later went on to be a session musician in Nashville and works at the WSM Grand Ole Opry on occasion. In response to a reader inquiry, we find that Slims served his country as part of the U. S. Navy. He was discharged on January 19, 1946. Chaw Mank also mentioned that his group had a show at noon at the time, but didn't say what station. A 1956 article tell us that during the war, he served for two years aboard the LST 812 in the Pacific Theatre. Slim passed away in 1994. "Little Joe" Black, electra harp, steel guitar and bass fiddle. 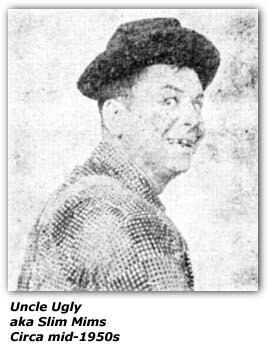 Hillbilly-Music.com wishes to thank Glenn Sutton, who was a member of Slim's band in 1957-8 for providing us with additional info and a picture of the group. Glenn eventually found his way to Nashville, where he became a songwriter.